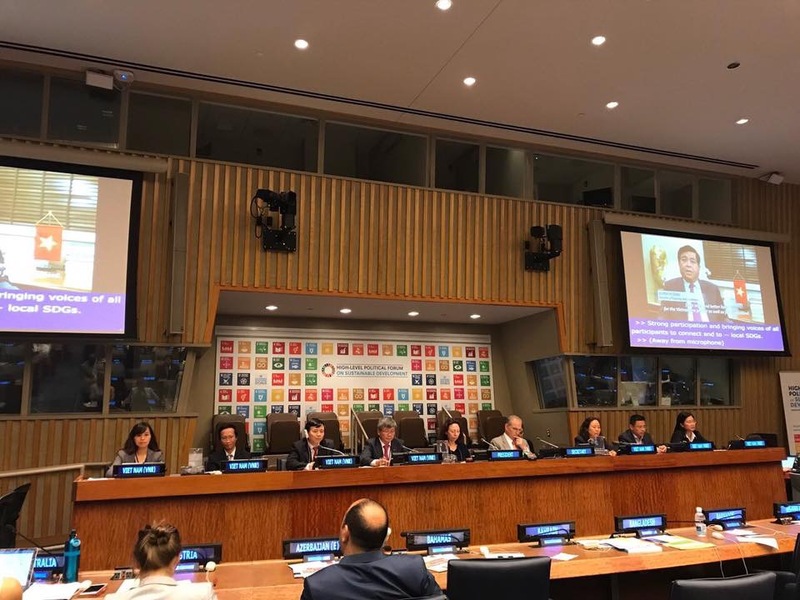 (MPI) - On July 16, 2018, at the United Nations Headquarters, New York, the Vietnamese delegation led by Deputy Minister of Planning and Investment Nguyen The Phuong officially presented its Voluntary National Review on the Implementation of the Sustainable Development Goals within the framework of the High Level Political Forum on Sustainable Development of the United Nations Economic and Social Council. The High-level Political Forum (HLPF) on sustainable development of the United Nations was established since after the Rio+20 Conference on Sustainable Development, replacing the previous United Nations Sustainable Development Committee. The Voluntary National Reviews (VNRs) are part of the intergovernmental process of monitoring and assessing the implementation of the SDGs of nations and presented at annual HLPFs, starting in 2016. The VNR preparation process of nations is not only a domestic preparation process but also involves related participation activities at regional and global level. Member States of the United Nations are required to have at least two VNRs in the period from now to 2030. Vietnam's VNR report highlights the results achieved in the implementation of the 17 SDGs in Viet Nam, analyzes the difficulties and challenges posed by the implementation of these goals, and gives proposals and recommendations to promote the implementation of SDGs in the coming time. Speaking to clarify the Review sent to the representatives at the Forum, head of the Vietnamese delegation, Deputy Minister of Planning and Investment Nguyen The Phuong affirmed that the viewpoint of sustainable development is integrated by Vietnam throughout the strategies and plans for socio-economic development and specified in the National Action Plan for the Implementation of the 2030 Sustainable Development Agenda with 115 specific goals to be in line with national development conditions and priorities. The outstanding achievements are Vietnam's GDP growth in 2015, 2016 and 2017, was 6.7%, 6.2%, and 6.8%, respectively, while the multi-dimensional poverty rate dropped from 9.9% in 2015 to less than 7% in 2017. Health insurance coverage reached 86.4% in 2017. Primary net enrollment rate reached 99.0% in the 2016-2017 school year. In 2016, the proportion of households having access to sources of safe water was 93.4% and of households having access to the electric grid was 99%. The percentage of the population using the Internet was 54.2% in 2017. The issues on the management of the environment and natural resources have also improved with an increase in forest coverage, reached 41.5% in 2017. Vietnam also has advanced in promoting gender equality in all fields of politics, economics, culture, and society; reducing inequalities and improving access to information and legislation for the people; focusing on vulnerable groups in society such as the poor, the disabled, ethnic minorities, etc., by implementing a series of policies to ensure leaving no one behind. Deputy Minister Nguyen The Phuong emphasized that Viet Nam had issued an Action Plan with a clear division of responsibilities of stakeholders in the implementation of the SDGs from the central to localities, including the National Assembly, the Government, the ministries, branches, social organizations, business and citizen communities. In addition, Vietnam has also strengthened its deep and comprehensive international integration, while strengthening its global partnerships, public-private partnerships to secure resources for sustainable development. Deputy Minister Nguyen The Phuong pointed out that in the process of implementation, Vietnam still faced many challenges in social and environmental issues, dealing with climate change, difficulties in financial resources and connections between sectors, fields, and the limited statistical capacity for monitoring the implementation of sustainable development. In the coming time, Vietnam will continue efforts to implement the Action Plan, promote sustainable economic growth in parallel with implementation of social progress and equality, ecological environment protection, management and effective use of natural resources, actively dealing with climate change, ensure that all citizens’ potentials are fully promoted and secure their participation in and enjoyment of development achievements; build a peaceful, prosperous, inclusive, equitable, civilized and sustainable Vietnam. Vietnam is committed to continuing promoting and being an initiative, active and responsible member of the international community in an attempt to ensure that no one is left behind. At the forum, an open and frank dialogue with representatives from other countries took place. All participants acknowledged and appreciated Vietnam's efforts, achievements, and commitments as well as the efforts of Vietnam’s Government in mobilizing the participation of all stakeholders in the implementation of sustainable development, showing Vietnam’s seriousness. At the same time, they asked Vietnam to share experiences in integrating SDGs into national socio-economic development strategies and plans. The HLPF was held from July 9th to 18th, with the participation of more than 2500 representatives from 193 UN member countries (80 of them were minister-level delegations), international organizations, non-governmental organizations and international scholars. This year's HLPF focused on discussing the theme "Transformation towards sustainable and resilient societies", reviewing the implementation of related 6/17 SDGs and reviewing the VNR of 47 countries. Vietnam is currently a member of the Economic and Social Council for the period 2016-2018./.